As a craft beer enthusiast I’ve heard Michael Jackson’s name and influence praised by brewers, craft beer industry personalities, and fellow craft beer enthusiasts for quite a while. However, despite having watched some of the videos featuring Michael on YouTube, I never felt that I truly understood and internalized his significance in the development of what we now call the “craft beer community.” That was until I found out that Beer Hunter: The Movie was available for individual purchase. At the beginning of the movie Fritz Maytag (Anchor Brewing) says “I think Michael Jackson did more for the brewing industry than anybody since Louis Pasteur.” While I believed this to be true from my past craft beer experiences, as the movie went on I not only understood it more and more, but it (Michael’s actions and influence) wholeheartedly increased my appreciation and love for all things that craft beer has to offer. As such, I will use this review to condense the notes I took while watching Beer Hunter: The Movie and to share my new found appreciation for Michael Jackson. The passion behind both drinking and brewing craft beer was of the utmost importance to Michael. In turn, I found that throughout this movie his words, actions, sense of humor, and demeanor can be seen as key parts of the now common perspectives and ideals shared by craft beer drinkers worldwide. Two quotes (both by Michael) that exemplify this are the following. First, while admiring a Belgian Champagne style bottle he said “I’ve often argued that Belgium treats beer like wine more than any other country does.” This can be seen nowadays with the rising respect of craft beer at fine dining restaurants and the stress put on presenting and bottling beers properly i.e. as they deserve to be. Next, while handing a cab driver some American craft beers (e.g. Midnight Sun Sockeye IPA and Schlafly Stout) he confidently says, “We’re not average people because we like good beer.” As one adopts the messages of craft beer this quote tends to become an increasingly bigger portion of one’s passion for seeking out new craft beer experiences. In terms of Michael’s actions here are some examples of how on one hand “Craft beer grew up with or because of Michael Jackson.” His influence continues to increase as craft beer as a whole grows and develops. His books (e.g. The World Guide to Beer and Great Beers of Belgium) both brought structure to craft beer and made people aware of the depth and variety of beers being brewed around them. Also, as he toured breweries around the world he helped instill and spread a passion for supporting local breweries. A couple key examples of this are the following. When visiting the Herald Brewery in Bohemia, Michael and his production team highlight the brewery’s use of local barley and Saaz hops and embracing of historical brewing practices such as floor malting and open fermentation. Next, I enjoyed that Michael always revisited breweries and pubs that he enjoyed and that his influence inspired growth that could be seen upon his return to those places. This could be seen in his visit to the Biddy Early brewery in Ireland and the yearly events he was a part of in Philadelphia. He particularly liked Philadelphia for its being a big city with local pride (pretzels, cheesesteaks, and of course beer). From my personal experiences living in New York City, local pride has definitely been a major factor in the recent growth of its craft beer scene. Furthermore, in today’s craft beer community (scene), supporting one’s local breweries and businesses and exploring the expanding list of new and old beer styles are tantamount to the rapid growth that it’s been experiencing since Michael’s passing in 2007. Being that I started exclusively drinking craft beer and homebrewing in 2009. The mutual respect and admiration shown between Michael and brewers who are now the “rockstars” (major influences and role models) of the craft beer community (and industry) throughout Beer Hunter: The Movie opened my eyes to how much of what Michael accomplished in his lifetime has shaped the way in which I have and continue to experience craft beer. I could go on and on about how well produced this movie was and the specific scenes that stood out to me, but I feel that in order to do it justice I feel that every craft beer drinker should experience it for him or herself. Therefore, if you haven’t seen it yet, I advise you to visit the Beer Hunter website and purchase the DVD or find out where screenings are being held in your area. Cheers to Michael Jackson, The Beer Hunter! 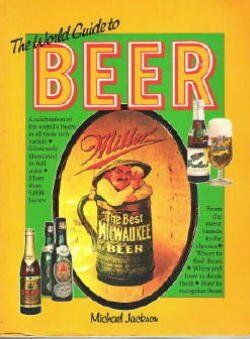 This entry was posted in Craft Beer Advocacy and tagged Beer Hunter, Beer Hunter: The Movie, craft beer, Fritz Maytag, Great Beers of Belgium, Michael Jackson, Sam Calagione, World Guide To Beer. Bookmark the permalink.